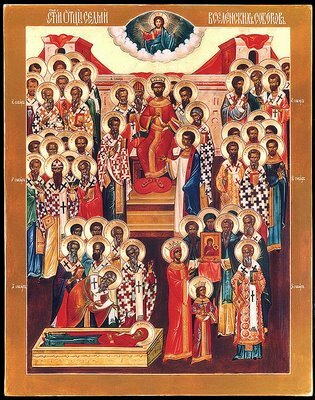 Troparion (Tone 8): You came down from on high, O Merciful One,* and accepted three days of burial* to free us from our sufferings. * O Lord, our life and our resurrection,* glory be to You. 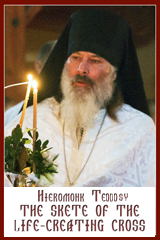 Troparion (Tone 8): Christ our God, You are glorified above all, You established our fathers as beacons on earth and through them guided all of us to the true faith. Glory to You, most compassionate Lord. Kontakion (Tone 8): When You rose from the tomb,* You also raised the dead and resurrected Adam. * Eve exults in Your resurrection,* and the ends of the world celebrate Your rising from the dead* O most merciful One. Kontakion (Tone 6): The Son who ineffably shone from the Father was born two-fold of nature from a woman. Beholding Him, we do not reject the image of His form; but depicting it, we revere it faithfully. 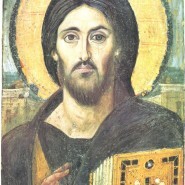 Therefore the Church, holding the true faith, kisses the icon of Christ’s becoming man. Theotokion (Tone 6): Undaunted patroness of Christians, O steadfast intermediary with the Creator, turn not away from the suppliant voices of sinners, but in your kindness come to help us who cry out to you in faith, Be quick to intercede, make haste to plead, for you are ever the patroness of those who honour you, O Mother of God. Prokimenon (Tone 4): Blessed are You, Lord God of our fathers,* and praised and glorified is Your name for ever (Dn 3:26). verse: For You are righteous in everything that You have done to us (Dn 3:27). Epistle: (Hebrews 13:7-16): Brethren, remember your leaders, those who spoke the word of God to you; consider the outcome of their way of life, and imitate their faith. Jesus Christ is the same yesterday and today and for ever. Do not be carried away by all kinds of strange teachings; for it is well for the heart to be strengthened by grace, not by regulations about food, which have not benefited those who observe them. We have an altar from which those who officiate in the tent have no right to eat. For the bodies of those animals whose blood is brought into the sanctuary by the high priest as a sacrifice for sin are burned outside the camp. Therefore Jesus also suffered outside the city gate in order to sanctify the people by his own blood. Let us then go to him outside the camp and bear the abuse he endured. For here we have no lasting city, but we are looking for the city that is to come. Through him, then, let us continually offer a sacrifice of praise to God, that is, the fruit of lips that confess his name. Do not neglect to do good and to share what you have, for such sacrifices are pleasing to God. Gospel: (John 17:1-13): Jesus raised his eyes to heaven and said, ‘Father, the hour has come; glorify your Son so that the Son may glorify you, since you have given him authority over all people, to give eternal life to all whom you have given him. And this is eternal life, that they may know you, the only true God, and Jesus Christ whom you have sent. I glorified you on earth by finishing the work that you gave me to do. So now, Father, glorify me in your own presence with the glory that I had in your presence before the world existed. ‘I have made your name known to those whom you gave me from the world. They were yours, and you gave them to me, and they have kept your word. Now they know that everything you have given me is from you; for the words that you gave to me I have given to them, and they have received them and know in truth that I came from you; and they have believed that you sent me. I am asking on their behalf; I am not asking on behalf of the world, but on behalf of those whom you gave me, because they are yours. All mine are yours, and yours are mine; and I have been glorified in them. And now I am no longer in the world, but they are in the world, and I am coming to you. Holy Father, protect them in your name that you have given me, so that they may be one, as we are one. While I was with them, I protected them in your name that you have given me. I guarded them, and not one of them was lost except the one destined to be lost, so that the scripture might be fulfilled. But now I am coming to you, and I speak these things in the world so that they may have my joy made complete in themselves.